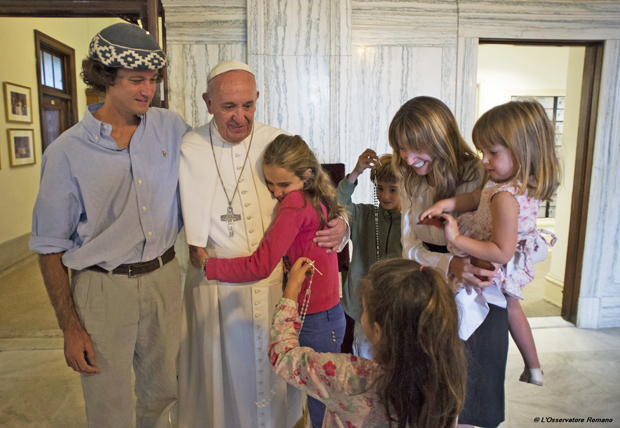 VATICAN CITY (CNS) — The Vatican has set April 8 for the release of “Amoris Laetitia” (“The Joy of Love”), Pope Francis’ reflection on the family and family life. The document, subtitled “On Love in the Family,” will be released at a Vatican news conference with Cardinal Lorenzo Baldisseri, general secretary of the Synod of Bishops, Austrian Cardinal Christoph Schonborn of Vienna and Giuseppina and Francesco Miano, a married couple who participated in both the 2014 and 2015 synods of bishops on the family. “Amoris Laetitia” is what is known as a “postsynodal apostolic exhortation,” a document addressed to the whole church reflecting on themes of church life and faith that have been discussed at a gathering of the Synod of Bishops. According to a variety of reports, the document will be long — perhaps as many as 200 pages. Speaking to reporters flying with him from Mexico to Rome in late February, Pope Francis said the document “will summarize all that the synod said,” including about broken families, the importance of serious marriage preparation programs, raising and educating children, and “integrating” divorced and civilly remarried Catholics into active parish life even if they cannot receive Communion. “The key word that the synod used — and I will refer back to it — is to ‘integrate’ wounded families, families with remarried spouses, and all this, into the life of the church,” the pope said on the plane Feb. 17.